BAGHDAD - Iraq’s Mosul Dam has long been branded the world’s most dangerous dam, at risk of collapsing and sending water crashing over millions of people. 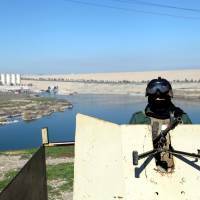 That prospect is even greater than was previously believed after the Islamic State group captured the dam briefly in 2014, according to a new report by U.S. Army engineers. Efforts to find a permanent solution for the dam, Iraq’s biggest, are held up by political wrangling and the price tag of more than $2 billion, leaving the country dependent on stopgap measures that some experts fear will no longer be enough. Iraq’s Water Resources Ministry says there is no imminent danger of collapse, despite the U.S. warnings. The dam’s core problem is that it was shoddily built on unstable ground: The earth underneath it is constantly being eroded by water. From the day it was inaugurated in 1985, maintenance crews have had to continuously pour cement under its foundation. 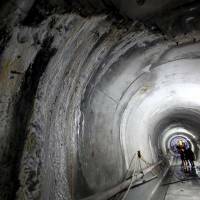 Without that constant injection — known as “grouting” — the 113-meter-high dam would soon collapse into a hole in the ground, causing an unprecedented disaster. The 30-mile long lake behind it would explode down the Tigris River valley with hundreds of millions of cubic meters of water, ramming into Iraq’s second-largest city, Mosul, currently home to more than 700,000 people about 40 miles downriver. It would then flood all the way down to Baghdad, some 340 miles south. U.S. officials have estimated more than a half million people could be killed. Millions more would be driven from their homes. Things have worsened because the dam was captured for several weeks in 2014 by the Islamic State group. 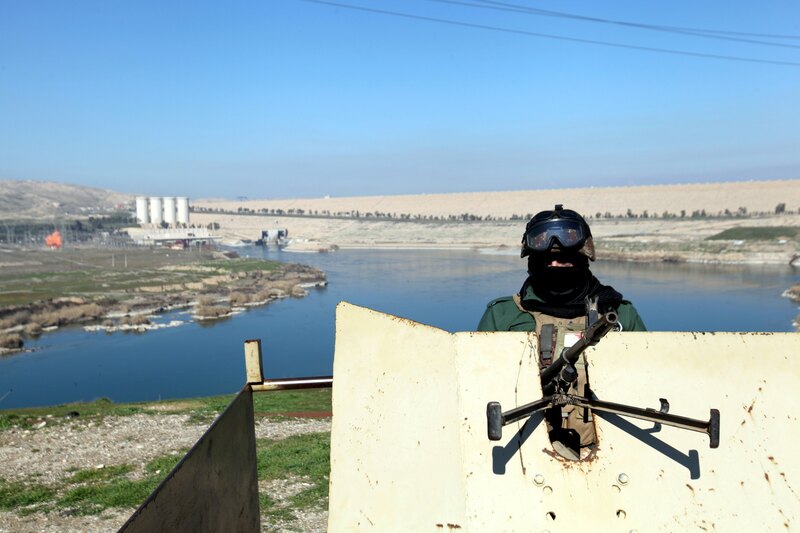 U.S.-backed Iraqi forces retook the dam, but no grouting took place for six weeks. Even since then, the grouting has not been up to full levels in part because the militants control the nearby factory that produces the concrete for the dam. As a result, there are “almost certainly … an unprecedented level of untreated voids” in the dam’s foundation from continuing erosion, the U.S. Army Corps of Engineers said in a Jan. 30 report. 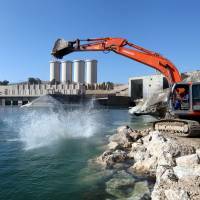 “Mosul Dam is at a significantly higher risk of failure than originally understood and is at a higher risk of failure today than it was a year ago,” said the report, which emerged in a parliament report made public on Monday. The report gave no estimated timeline for a potential collapse, but U.S. officials and engineers warn it could happen at any time. 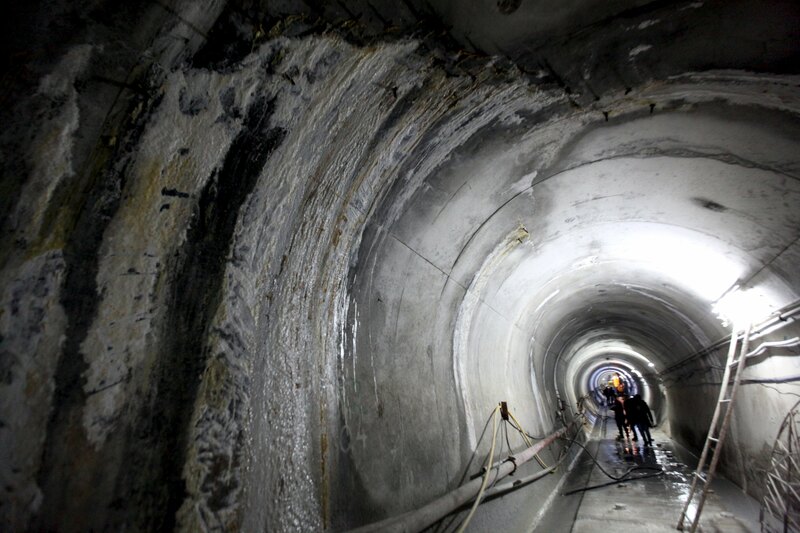 Grouting can extend the dam’s lifespan, but any disruption could quickly turn disastrous. 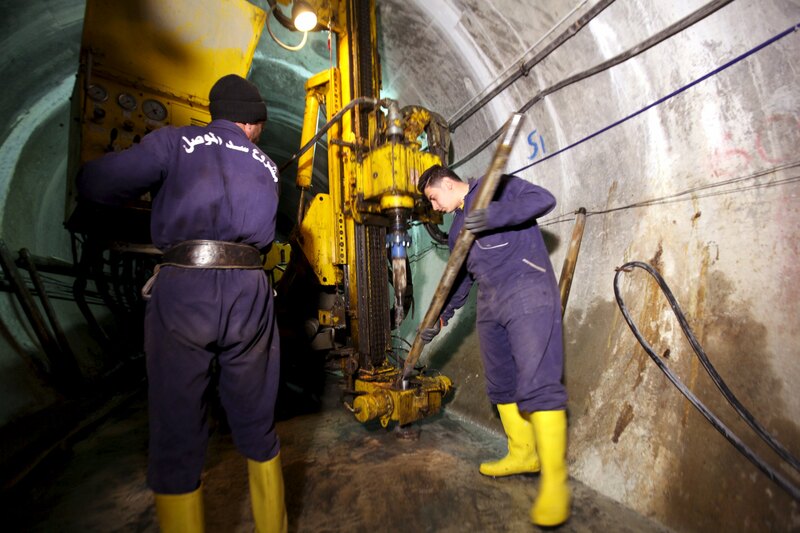 An Italian engineering firm, the Trevi Group, is set to sign a contract with the Iraqi government to begin shoring up the dam. But no one thinks this will permanently solve the problem. The only permanent solution is building a second dam, which could cost upward of $2 billion. In 2006, the previous Iraqi government was in negotiations to continue building the Badush Dam downstream, but no deal was ever reached because of the cost. 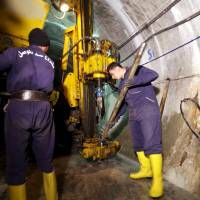 Water Resources Minister Mohsen al-Shimari dismissed the U.S. warnings, saying continued grouting will stave off collapse. Other politicians played down the severity of the problem. In a report this week, parliament’s agriculture and water committee praised the government’s plan to address the dam as “extraordinary.” The report made no mention of the need for a long-term solution. Prime Minister Haider al-Abadi knows the dam is likely unfixable, as experts have warned, said a person close to the premier’s office, speaking on condition of anonymity because he was not authorized to speak on the subject. He said American officials have told al-Abadi that a collapse “could be 1,000 times worse than Katrina,” and the prime minister’s office updated evacuation plans in August. But he said there are currently no plans in place to build a second, backup dam. U.S. officials have warned of the danger for years. In 2006, the U.S. Army Corps of Engineers called it “the most dangerous dam in the world.” A $27 million U.S. project to rehabilitate the dam after the 2003 U.S.-led invasion failed to achieve any practical results, according to the special inspector general for Iraqi reconstruction. Built under the rule of Saddam Hussein — and originally named Saddam Dam — it was politics that placed it on an eroding geological base. Saddam’s deputy, Taha Yassin Ramadan, chose the site in an effort to bring jobs to Mosul, said Nadhir al-Ansari, a former adviser to the minister of irrigation who witnessed the initial stages of construction in 1980. “When I went there I was shocked,” said al-Ansari, who is now an engineering professor at Lulea University of Technology in Sweden. He recalled walking though large caves at the site that immediately indicated to him it was unstable. Within a year, leaks sprouted and the floor of the reservoir began to collapse, creating sinkholes. 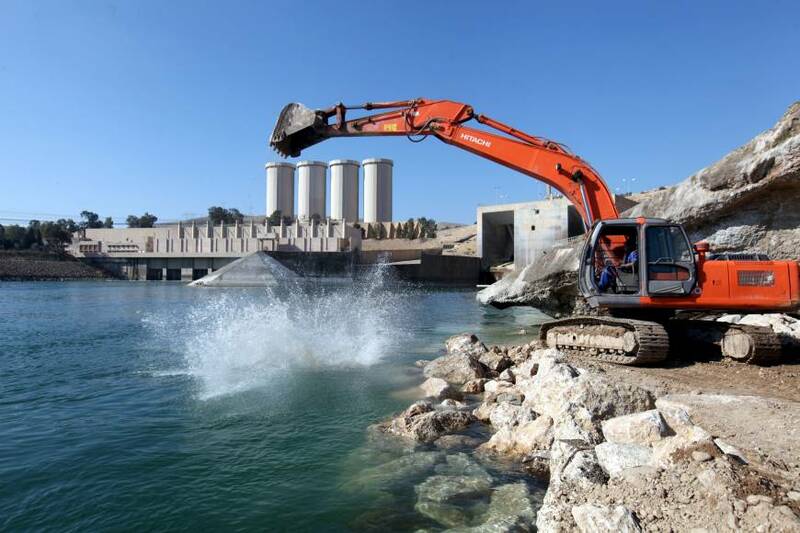 The Iraqi government was so concerned it began building the Badush Dam as a replacement. But construction halted in 1990 with the imposition of U.N. sanctions.